Sometimes we don't do things because we're afraid of the outcome, that's perfectly normal, because ultimately our fear response is our “I want to live” response to situations, and to ignore that would be like wanting to die, or something. That being said, we often find ourselves fearing the most mundane situations. The question is, do we acknowledge this fear, or do we just power through it? Our fear response doesn't signal an aversion to something, it signals the readiness to commit to something, it's the release of adrenaline, that's why its called “fight or flight.” The problem is, we've probably often had this release in a social situation, one time or another. But how should we react to this? Fear tells us that what we're thinking of doing is a bad idea, but we must not forget, we would not be feeling fear in such a situation if we did not want to do what we were thinking of, and it may not be as straightforward a concept as “It is a bad idea,” which acts as the catalyst to our fear. I thought this article needed a picture, so I dug up this. Although our immediate response may be “It's a bad idea,” that may not be the underlying problem which causes our fear, especially in social situations where we're afraid to be assertive in whatever way. The thing to do is ask yourself “Why do I fear?” For example, I want to go over to someone to talk to them, but I am worried how they will view me afterwards. Now, someone with that mindset, as tantalising as it may be, seems to have every right to fear. Why? Because with such a mindset, the person is likely to not get a good impression of you! The result is strangely paradoxical. It's easy to say, “Don't care what anybody thinks about you,” as a form of advice, and while that is often sound advice, it also leads to the conundrum whereby being someone unlikeable is appreciated, which again acts as a paradox within itself. If you don't care what people think about you, you're likely to generate negative attitudes. So what do you do? You have to understand why you fear, and solve that, rather than trying to force your way through fear. Remember, fear exists for a reason. Going back to the example of being assertive and beginning a conversation: If you're afraid of the impression you're going to give, then you're going to be extra careful not to give a bad impression, which means you're going to go at lengths to conform to the other person to make sure that they appreciate your mannerisms, which means that ultimately you're not being yourself. Now you're setting quite an arduous task up for yourself there; in a sense you're having to delve into the relatively unknown abyss of conformity towards a person you don't even know. That in itself is quite scary. What I'm trying to get across is that we always fear for a good reason, but that doesn't make it a straightforward reason. “I'm afraid of what they may think,” may be the base of our anxiety, but there's still an underlying reason for that mindset. “What may they think?” or “Why do I think they will think these things?” are questions to ask. Often it leads to the paradoxical situation where fear creates fear, “Because I am afraid, I can not conduct myself properly,” but understanding this paradox is the first step to overcoming it. However, always take note, it may not be that particular paradox which causes you to fear, there are a multitude of reasons why fear may be caused, but ultimately your fear is there to be listened to, not ignored. I must stress that this does not mean it is always right to follow your fear, but remember that fear is there to tell you something about yourself, whether it be that you're a raving lunatic for even thinking of doing what you just thought of, or that something is not quite right about you, (whether it be your mindset, attitude, focus, or anything,) to carry out whatever it is you wanted to do. The important thing is to take note and amend the problem, rather than just trying to power through the fear itself. Guilty Gear 2 is a game unlike anything else, (actually, I only know of two games anything like this one, one being Brutal Legend, another excellent game.) An action/RTS hybrid which amounts mind-boggling consequences. I've seen this game get a lot of negative feedback, most of which says that the hybrid doesn't work, is sloppy, or is uncomplimentary. This is simply not true. Granted, the game is difficult to play, and there isn't really any solid basis of comparison to help pick up its mechanics, but the action and RTS mechanics flow seamlessly into one another, so well in fact, that one is easily lost between the spectrum of the two. As you can see, there is a lot going on. 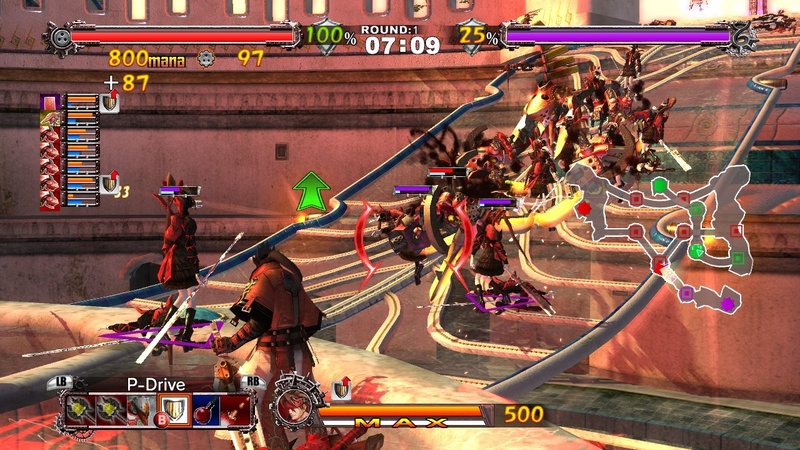 Guilty Gear 2 essentially has two playing fields, the Organ, (where most of the RTS elements are carried out,) and the field, (where the game takes place.) In the Organ you can buy your troops, send them into the field, and purchase items or abilities for your character. 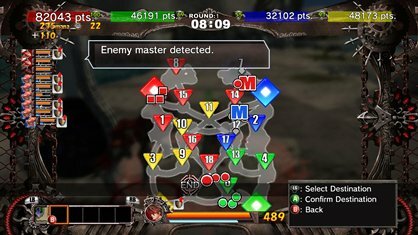 The game makes the RTS element's a little bit easier by allowing you only to send your units to specific points on the map (known as Ghosts,) seeing as you won't be sending your units anywhere else, this doesn't hinder the game at all, and you can even pick alternate routes to every ghost, making the progression slightly more non-linear. The RTS element's do not end with the organ however, your master (player-character) has the ability to pick up and transport his troops, allowing you an even greater element of strategy: quick-retreat, blocking off choke-points, bypassing enemy defence, are all possible. Not to mention the various items or master-skills which can help aid your units, forcing your opponent to change his strategy. For the action element of it then, Guilty Gear 2 comes complete with a full 3D fighting game integrated into its system, and despite only having two buttons, the series manages to move gracefully from it's four (technically five) button 2D counterpart. Your master is your army's strongest unit, and so its extremely important to be active all the time. This is where most of the discrepancy comes from, I think, because this means your time in the organ has to be FAST, (as with any RTS really,) because your master is simply a vital part of your game. And of course, there will always be the enemy master in the same position, who's actions must be watched carefully. One of the only things that Guilty Gear 2 has to turn people away is it's difficulty, it can be hard to see what's going on with the constant frantic action of the battle-field, and it's easy to neglect certain areas of the map in the ensuing chaos, especially during intense master VS master battles. On top of this, some of the maps are huge, and frankly, confusing. Twisting paths lead to an ensemble of different routes, and it's easy to lose yourself and your army within them. However, at the end of the day, this is Guilty Gear we're talking about. Already known for being one of the hardest 2D fighters to pick up and play, the profound difficulty of Guilty Gear 2 is only to be expected. And just like its 2D predecessor, the learning curve is well worth the intensity of the gameplay, and as the only game of it's kind (it's far too different than the few other action/RTS games,) it's well worth checking out. The Avengers movie, or The Avengers Assemble, for the more politically correct of us. Now, I can't help but feel odd writing this straight after I've seen the movie (It seems unnatural.) but it's probably going to be posted some time in the far future, so, off we go! I don't usually watch superhero movies anymore. Don't get me wrong, I love Spiderman (But not his Toby Maguire rendition,) but superhero movies just never seem to cut it for me. I know why this is of course (or at least I think I do.) It's because they're aimed to appease fans by bringing their superhero fantasies to the 'big screen' as it were, and because they have lots of mindless action where the plot should be. But despite me slagging off the genre like this, I have to say, at least the first part (the first part) of the Avengers Assemble was actually pretty good. 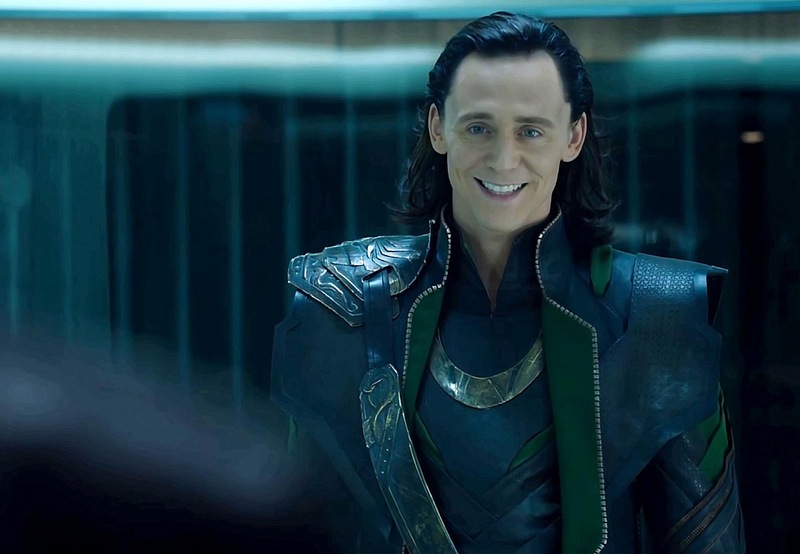 Perhaps my judgement was clouded by the fact that the conversation that me and my friend were having about Friedrich Nietzsche's master/slave psychology prior to watching the movie actually came up in part at the beginning, but all in all it was probably because Loki was so delightfully awesome. Disclaimer: Yes I am going to spoil the plot of the movie (or at least part of it.) If you disagree with my action or think that it is wrong, you can read what I have to say about you. Where do I start? I'll start with Loki, because he's just so cool. After his initial appearance, he decides to crash a ball (that's the dancing kind,) smack people around with his staff as if he's playing golf, and then do the PG13 equivalent of rip a man's eye out of his skull. I have to praise Tom Hiddleston's acting here, he's just so maniacal, he swaps from peak concentration to having sadistic fun so fluidly; maybe I'm just crazy but that transition meant something to me. Next, however, we see him subjugate the flock of people escaping the gathering, and this is where he makes his motivation apparent. “Humans desire to be subjugated.” I don't know if that’s the exact quote, but that motivation was perfect. Loki, as a God, has the right that no other villain has to declare that over his victims, it escalates to the point where an audience can actually have sympathy for him as a villain, because his point makes so much sense. No “misguided revenge,” or “apocalyptic demon” agenda, he actually has a good reason to do everything he does, and tries to portray that to those that would be his subjects. Sure, perhaps he went a bit over the top with his mind control and execution of people who disobeyed him, but this movie was flawed from the start, what I'm trying to point out is it's Potential. Could he be any more evil? Actually, now that I think about it, Loki should have made example of people who disobeyed him plainly, and praised those who disobeyed him with temerity (as in, people who actually had a use in his kingdom.) And his mind-control wand of doom should have simply 'enlightened' people, rather than taking over their heads, (which he claimed it did, but the movie didn't make a point of showing that.) Maybe this view is some kind of subconscious imperialism slipping from the depths of my mind, but if that's the case then it further supports his view that people exist to be subjugated, so in that sense it's all good. Building upon this, after Loki gets captured by our happy crew of Avengers, he begins to play on them from within his cell, using the fact that he is under complete surveillance to his advantage, and aiming to turn them against each other. His ploy is more than obvious from the start (turn The Hulk into The Hulk,) but it wasn't the kind of blaring obvious which hurts the execution, and it added to Loki's amazing manipulative ability, really giving him more authority to carry out his plans than just some power-hungry villain, (he knew what he was on about when he said he would be ruling the Earth.) If I can say anything about how this was handled however, I would say that it took far too long. The movie as a whole was too long, it could have been shortened at multiple points, and this was one of them. Loki spent too long in that cell. Just for reference's sake: There is a point in this movie where it becomes safe to walk out of the viewing room and never look back at it again. I would say that that point is precisely where Hawkeye (who regrettably went without a costume...) shoots an explosive arrow at one of the S.H.I.E.L.D. airship's engines, blowing the whole thing up and initiating the start of the downfall of the movie. Ah, this is one of those wonderful cases where there is just so much to write about something which could have been so much better. But alas, I shall hold my tongue for now.